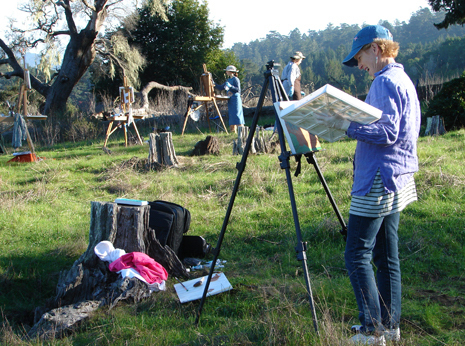 Have you always wanted to paint a landscape or draw a scene while out on a hike? Do you like color and drawing materials, but are just not sure how to get started? Would you like to capture the effects of light and shadow on the landscape, with vibrancy and realism, in your own drawing or painting? One or more of my Workshops may be a good fit for you! I have been teaching art and design at the Academy of Art University for over 20 years. I thoroughly enjoy helping students at all levels to improve their skills, increase their artistic confidence, and reach their creative potential. Private Lessons: Private lessons are available for any of the courses above. Please contact me directly for rates and scheduling. Media Taught Oil, watercolor, pencil, ink and ink wash. Locations: Depending on the workshop selected: Point Reyes National Seashore, CA, the Sonoma County Coast, or at my studio in Sebastopol, CA. You may request the current schedule of workshops by checking the Calendar page, or by going to my Contact page and sending me a message. Be sure to provide the title of the workshop you are interested in attending in the subject of the message. Payment of a course deposit will secure you a spot in the workshop. Workshops are normally limited to just 8 participants so as to provide a maximum of instructor attention for each student. Minimum registration for a workshop to run is 5 students, so invite some friends! Deposits will only be refunded to participants if the class registered for fails to run due to low enrollment, or due to cancellation by instructor. Further information, a class materials list, and directions to the workshop location will be sent to you via email upon receipt of the deposit. Introduction to Landscape Painting with Oils- This two-day workshop will help both the beginner and intermediate oil painter alike feel more comfortable and achieve better results when working outdoors or en plein air. Site selection, equipment, view framing, value contrast, shadow shapes and form, composition, perspective, focal points and color mixing and application will be discussed and demonstrated. A short amount of studio work on day one, followed by working outside as weather permits. 10 AM to 4 PM, both days. Workshop cost = $275 ($100 deposit holds your place.) For more information and how to register for this workshop see the Calendar page. Perspective Drawing for Artists- This one-day workshop will delve into the theory and practice of linear perspective drawing as it pertains to the working artist. Eye level, vanishing points, position of view, picture plane, cone of vision, light and shadows, will all be discussed, demonstrated and practiced. 1 Point System, 2 Point Systems and 3 Point systems will be demonstrated. Would you like buildings or rooms in your drawings and paintings, and the people in them, to look more realistic? Do roof line angles drive you crazy? Want to learn how to draw stairs convincingly? This is the workshop for you! Studio work and some drawing outdoors weather permitting. 9 AM to 4 PM. Workshop cost = $150 ($75 deposit holds your place.) For more information and how to register for this workshop see the Calendar page.